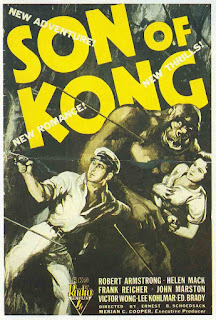 The great success of King Kong even during the worst of the Depression gave RKO the confidence to produce an inevitable sequel. The speed of its release was unprecedented, a mere nine months after the original at the end of that same year of 1933. 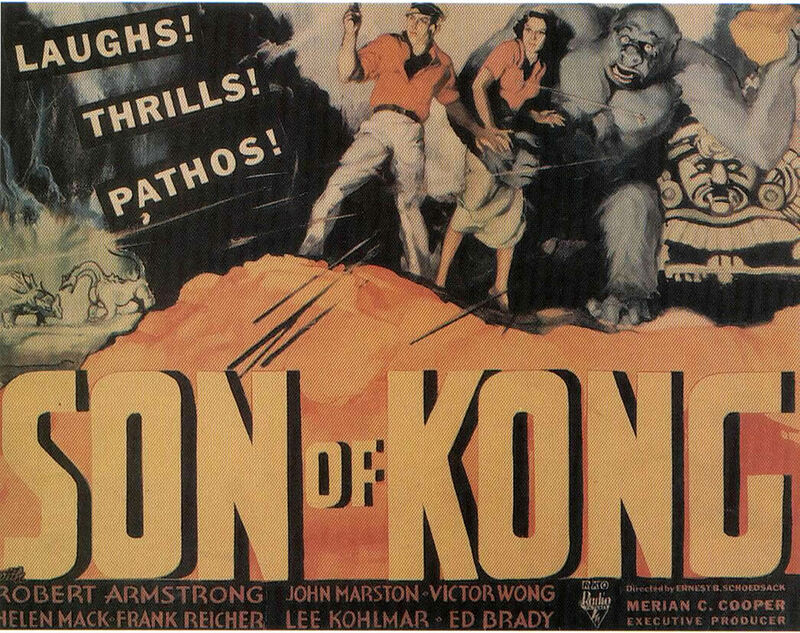 The rush to capitalise on Kong fever however resulted in cut corners, a much smaller budget and production schedule that showed in the final result. Amongst the team reunited for it was effects supremo Willis O’Brien who under the circumstances chose to leave much of the sub-par animated work to his assistant and asked for his name not to be credited (although he is , in bold font size, as Chief Technician). The director this time was solely Ernest P. Schoedsack, without the input of Merian C. Cooper. 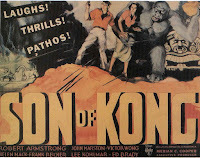 The film betrays the lack of expense firstly in the script’s structure, again written by Ruth Rose, by being an exotic sea-faring melodrama sparked by Carl Denham (returning Robert Armstrong) needing to escape an impending Grand Jury indictment and constant shower of writs being served to him in the aftermath of Kong’s New York rampage. The opening shot of the poster proudly boasting Kong’s debut not only haunts him but will also do the same to us. “I’m sure paying for what I did to you” he says softly to it. He re-teams with the S.S. Venture’s old Captain Englehorn, Frank Reicher, who makes him an offer to begin again in partnership using the ship as a freight business. With Victor Wong once again as the pidgin-speaking cook Charlie, they set sail for the Orient, landing in the port of Dakang. Armstrong said he preferred The Son of Kong to the original due simply to its greater emphasis on his character’s development. He is probably alone in shouldering this as well as the burden of Denham’s law-suits. Admittedly it’s true that the human story very much focuses on him, his latent humanity and a delicately-developed romance; but this is supposed to be a Kong film, promising plentiful ‘Hulk-smash’ special effects more than love among the Tropics. There is an early hint as to how disappointingly the simian creatures will be respected when he and the Captain take in a show at the port. They see a ropey stage act beginning with performing chimps in costumes playing instruments, an uncomfortable sight if you consider the cruelty of how monkeys can be treated for this type of entertainment. The compere is a moth-eaten alcoholic ex-ringmaster, played by veteran movie actor Clarence Wilson, who then introduces to the rubes the charming ‘Helene’, Hilda in the credits, to perform the song ‘Runaway Blues’. While this is obvious padding, it gives us an opportunity to see the one true find of the film in the casting of Helen Mack. She makes a beguiling and memorable leading lady, possessed of a still, soulful quality and a streetwise wisdom behind her dark eyes that gives Son its only layer of heart and depth. Mack later appeared in high-quality comedies, with Harold Lloyd in The Milky Way and the super-fast screwball delight His Girl Friday. Here, she endures the drama of her father being killed after a drunken brawl with ex-Captain Nils Helstrom (John Marston) which results in their show-tent livelihood being burnt down. She has nothing left to lose and after making a tender impression on Denham, stows away aboard his ship. The shady Helstrom proves that he will do anything to get away as well. In return for safe passage aboard the Venture, he persuades Denham to send the party back to Kong’s home of Skull Island with a faked promise of treasure there. Despite telegraphing his inherent dodginess facially, he awakens Denham’s adventurous side as well as his greed. Helstrom was the one who gave him the original map for his first voyage. (The fact this incentive was never mentioned before is brushed aside). At least Hilda is smart enough not to trust him. The ship’s crew are equally shrewd and mutiny at the thought of re-living their monster nightmare of before. They pack Denham, Hilda, Englehorn and, as an after-thought, Helstrom off in a life-boat. Shamefully, we’re already into the third act of Son, thus testing our patience that we may have been sold a plodding ‘B’ picture programmer in disguise. Once the principals wash up on the island, here the plot becomes all-at-sea. Immediately, they are met by Noble Johnson’s tribal chief and his natives from last time with such promptness it’s as though they’d been on the shore expecting him since March’s King Kong premiere. Once that obligatory cameo is dismissed, our cast row to another cave inlet where we see a first glimpse of how much the effects quality has deteriorated. In rushing this sequel out, the matte glass painting work that created sumptuous levels and depth in the original is delivered here in noticeably sloppy superimposed form. More demoralising is what comes next. Denham comes face to rear-projected face with the small but familiar head of what emerges as Little Kong. “I never knew that Kong had a son” he says with awe. Unfortunately, what passes for junior is a disappointment to his legacy. Don’t get me wrong, Little Kong has a certain child-like charm. 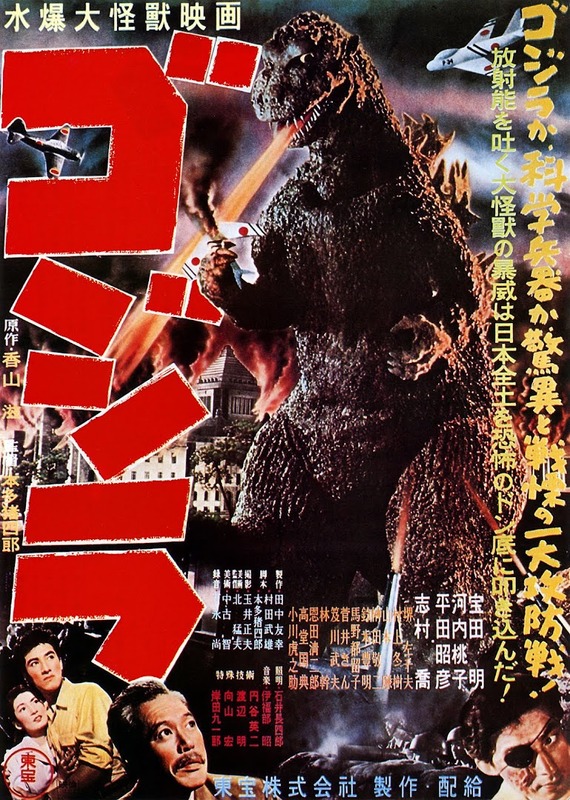 He’s definitely a gorilla, albino, smaller in stature naturally and manages a few gestures that are cute, yet the stop-motion is jerkier, much less finessed than before, resembling a crude screen-test for the earlier film instead of building on its amazing technology. As Denham helps free him from quicksand, Little Kong emits odd all-too-human sound effects of cooing and grunting that don’t help in suspending our disbelief that this is slapdash animation - in fact, it reminds me of the facetious Kong creature in Flesh Gordon. (A more successfully-rendered creature is the Styracosaurus that chases our heroes into a cave. It is smoother and shown on screen just long enough to make an impact without exposing any shortcomings). The big fight scene for Kong Jr is against a giant black bear, which intriguingly is made bigger than him for dramatic effect. We may be meant to regard this as an echo of his father’s titanic clash with the T-Rex in Kong, which could have worked if the animators didn’t ruin it with the fatal decision to go for laughs instead of tense action. Mid-battle, Kong falls dazed against a rock and does the rolling eyes and cartoon tweety-bird reaction that robs him of any dignity. Moreover, he wins by merely chasing the bear off with a tree-trunk. Kong Snr would have covered his face in shame. “Say, can he scrap just like his old man”, says Denham, showing he hasn’t lost his instinct for turd-polishing sales hype. Poor little Kong sustains a finger wound that Denham dresses with a bandage ripped from Hilda’s skirt (by her I should add). This is a nice pathos moment slightly undermined by those of us who notice it’s his middle finger and unintentionally has him ‘flipping the bird’ for a moment. Kong rewards their Florence Nightingale ministrations by shaking the coconut tree’s contents down in a shower for Hilda. We then get to the location of what actually turns out to be treasure, guarded by a huge carved idol encrusted with jewels. Kong wades into another fight, this time with a lizard-esque Nothosaurus, but it’s so hurried that when he tweaks its lifeless jaw at the end (another reference to his dad’s playful curiosity, post-T-Rex rumble) the move plays too quickly to score with us. Helstrom reveals his lie, leading to his comeuppance via a Cetlosaurus chowing down on him which only leaves us the final set-piece, a frustrating effects sequence in that it hints at what could have been a really powerful climax as the island is sunk by a huge storm. 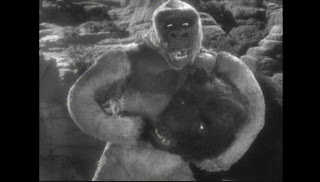 Denham is rescued by Kong, to begin with in poorly-realised long-shots of him hoisting the human onto a dry mound and then in an almost-effective ending, is hoisted above the waves by the gorilla’s mighty arm to be taken by his friends to safety aboard a small boat. The sharp editing suggests initially that the show-man was going to die in a bravura showbiz finish by drowning with Kong, an uncommercial ending to be sure, but arguably a poignant and poetic demise. By salvaging Denham and wiping out Kong, it only reminds us that the undeserving humans survive and that it’s never a good idea for gorillas to trust us. Ruth Rose cannily surmised that since The Son of Kong was not going to compete with its predecessor on spectacle, it could at least on the humour front. Whilst the broad comedy slapstick and goonery of his offspring cheapens the attempt to create a worthy follow-up to King Kong, a lightness of touch is at least partly successful in the romance between Denham and Hilda. When she coyly suggests at the close that they might make a nice couple, combining their treasure shares, he gently agrees with her. “It’s alright”.